I know you may be getting tired of all my snow pictures (especially those of you who get a lot of snow like this) but I had to post just a few more. This is totally historic for us! We got another snow last night and today, on top of our almost 3 ft. from a few days ago. 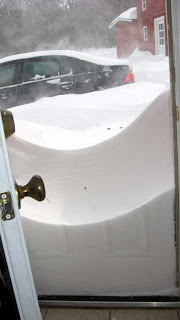 We are guessing it was around a foot or so but it was impossible to really measure it because it really was a blizzard!! The wind is crazy!! (am listening to it blow around right now). All the trenches Charlie dug the other day are like 1/2 filled up, well some of them are all the way full of snow again. And he spent hours digging out the cars the past 2 days only to have a bulk of the work undone by the blowing snow. . . I mean there is a wall in front of the truck again!! We are up to like 100" of snow up here for the year! This is our back door. This was clear the day before (charlie dug it out, he dug the car out too, it was covered with the first snow). Notice the pattern of the door on the snow!! This picture also shows how the snow was blowing around. It wasn't snowing most of the day today, but the wind was blowing so hard that the snow on the ground was blowing around . . . and according to Charlie, it was painful when it hit you! Needless to say, the kids did NOT go out and play today! 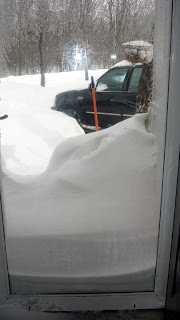 This is our front door, the snow is pressed up against the glass outer door there and if you look at the bottom of the picture, you can see where some has actually migrated inside the house (we haven't opened the storm door yet, it was hard to open because it was blocked so much). 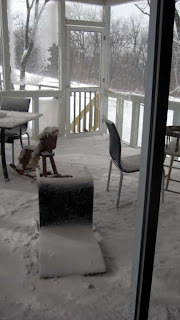 What is so interesting about this picture is that the porch there, where all the snow is, has a roof on it!! So all that snow blew in there!! This is our screen porch (that Charlie built BTW ;0). Normally when you look out there you see the gray tile on the floor! That is all covered with snow that blew through the screen. 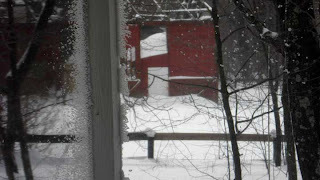 This is the barn, the snow is about 1/2 way up the door there!! Also, the middle board of the 3 board fence is completely covered!! All this snow is kind of like an adventure. Luckily we haven't lost power or anything and we have just been enjoying hanging out. We have been making WAY too much junk food (cookies and stuff that we don't normally eat a lot of) but that is part of the fun! Oh and snow cream! We have been putting wood floors in the bedroom (the last room we have to do) so we had mattresses out in the living room and stuff . . . the kids have been loving it.